The recent Law graduate sat down with Rugby World to chat about superstitions, life outside rugby – potentially starting another degree [apparently Law wasn’t hard enough], and how many find it hard to spell his name. RUGBY WORLD: Who are the jokers with the Ospreys and Wales? 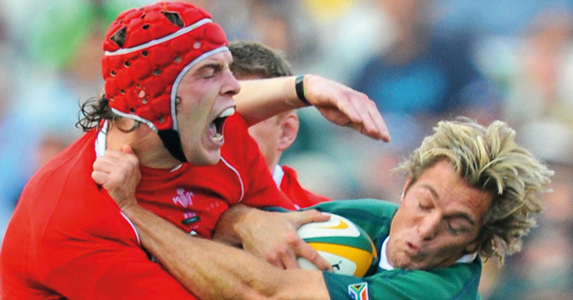 ALUN WYN JONES: Andrew Millward and Marty Holah at the Ospreys, and Mark Jones for Wales. RW: Can you remember any good practical jokes played? AWJ: The one that stands out is when Mark Jones left a sheep in Dwayne Peel’s room during the World Cup. RW: What can’t you live without when you’re on tour? AWJ: My iPod. It’s vital for all those long plane journeys. RW: You’re studying for a law degree as well as playing rugby. Do you take your law books with you on tour? AWJ: Yes I do, but they’re rarely read, although they’re quite good at helping me get to sleep. Perhaps I shouldn’t have said that! RW: What’s the funniest thing you’ve seen or heard on the pitch – any good sledging, for example? 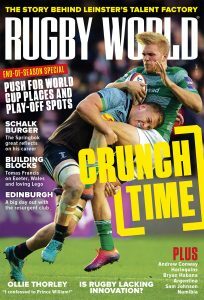 AWJ: Nothing that is clean enough for a magazine like Rugby World! RW: Do you have any bugbears? AWJ: People being late and general bad manners. AWJ: Gwyn Jones. In one of my first training sessions at the Ospreys – when I was 18 – I wore a pair of borrowed boots, which were bright white. White in Welsh is ‘gwyn’. RW: What’s the worst spelling of your name you’ve ever seen? AWJ: Some of the French attempts have been amazing. One that stands out was something like ‘Allain Wynne Jones’. Pre-match routines, Embarrassing moments and Bad jokes..
RW: What about your pre-match routine – any superstitions? AWJ: I always put my socks and boots on in a certain order. RW: Aside from a house or a car, what’s the most expensive thing you’ve ever bought? AWJ: A watch or jacket, not sure which. RW: What are the worst headlines you’ve seen about yourself? AWJ: The cheesy ones, puns on ‘Wyn’, such as ‘You’ve got to be in it to Wyn it’. AWJ: My Welsh cap, my iPod and my Ospreys contract. AWJ: To successfully complete my law degree next year, and then perhaps go on to study something else, media or marketing maybe. I like to keep my mind ticking over away from rugby. RW: What’s been your most embarrassing moment? AWJ: People who ask me, “Can I have your autograph please, Ryan?” I don’t look anything like Ryan Jones. His ears are much bigger than mine! RW: You’re renowned as a good singer – do you have a karaoke song? AWJ: Why do giraffes have long necks? Because their feet are smelly. AWJ: The ability to take other superheroes’ powers. RW: Who or what in the world do you think is overrated?